In 1991, Lindsay and his mother Coral Kaan moved the business from Port Chalmers into our current 29 Willis Street Dunedin buildings with generous supports by Dunedin food service industry. Our business had grown from being a small fruit and vegetable family business into a successful established food distribution company by hardworking Kaan’s family members and their dedicated staffs. We are now one of Otago’s largest wholesale food distributors and we also now have a branch in Christchurch. We carry over 3,000 different quality product lines with fresh fruits, vegetables, seafood, meat, dry goods, containers, condiments and several others to meet your food service industry requirements. We know fresh is best; therefore, we have our own Dunedin based in-house prepared vegetables and butchery facilities to help reducing your prep-time at work. We prepare a wide range of fruits and vegetables on request and the butchery department can provide the best cut and pack fresh meat to your specific requirement. We have our compliance officer in charge of food and work safety to ensure our quality and meet OSH requirements. At Kaan’s, we value cultural differences and we want to bridge languages barriers with our customers; therefore, our ethnic department offers services in Cantonese, Mandarin and Thai to help our customers work effortlessly in New Zealand. 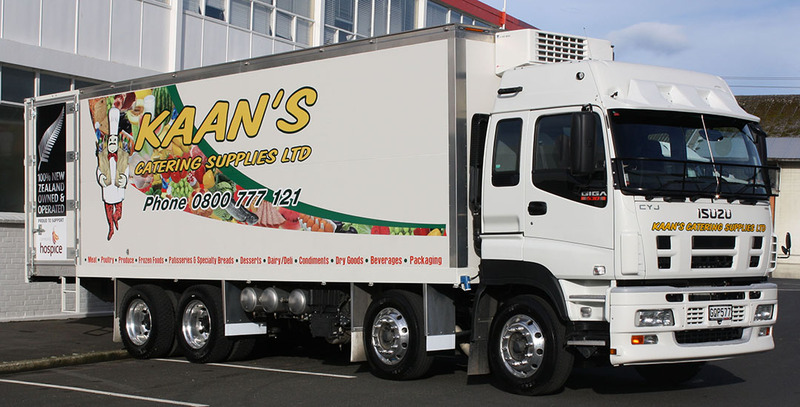 To give back to our supportive community, Kaan’s Catering Supplies proudly supports hospices and we have been a part of Special Rigs for Special Kids for more than 10 years as well as many other charities. Our business is now employing more than 120 staffs within the South Island and we are still continuing to expand. We are proudly a member of CDNZ (Country wide Distributor New Zealand), which is a network of New Zealand owned food distribution companies.